The LASEMA Response Team received a distress call at about 9.09 am via the CRM on Saturday 23th December, 2017. 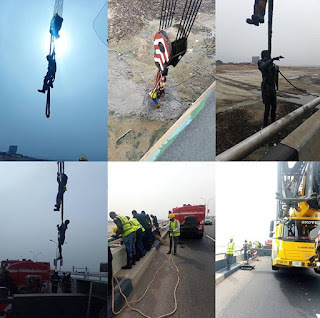 This eased up the rapid activation of the Agency's Response Team to the scene of the incident with other responders such as the Lagos State Fire Service and the Lagos State Ambulance Services. An investigation carried out by the LRT revealed that a middle-aged Male(Destitute) was said to have been stuck in the mud for over 24 hours at the sandfill spot, Third Mainland Bridge inward Iyana Oworo. The yet to be identified victim was rescued from the mud by the use of the Agency's Crane whose boom was projected and extended to the muddy sand filled area wherein the victim was stuck and subsequently rescued by the Agency's official who accompanied the crane. He was later moved to Gbagada General Hospital for proper medical treatment.